Fires are, and always have been, a part of the South African landscape. and sometimes in indigenous forests. Fires are, and always have been, a part of the South African landscape. They occur as a natural phenomenon in grasslands, woodlands, fynbos, and sometimes in indigenous forests. 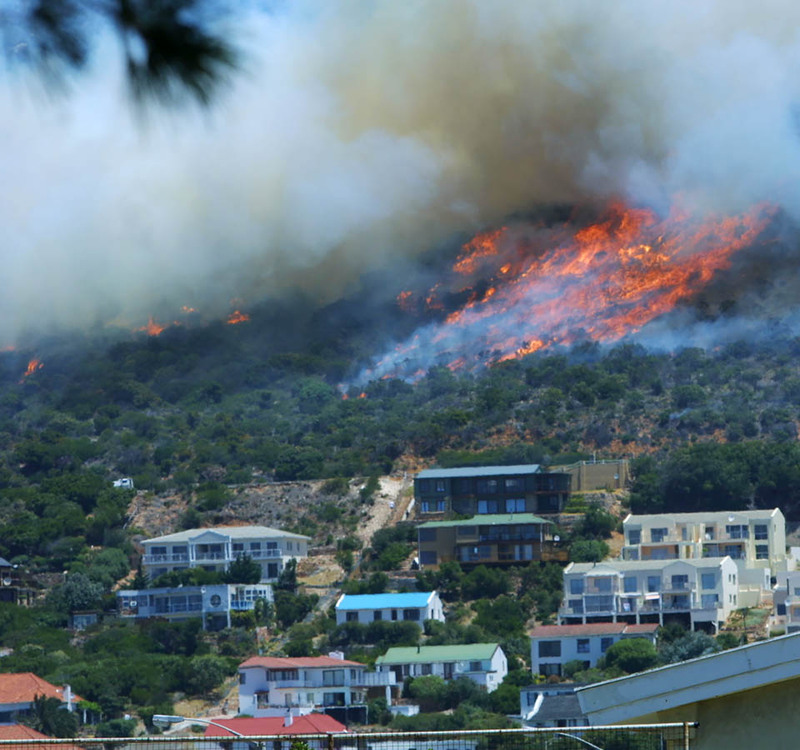 South Africa has two fire seasons according to rainfall patterns, the dry summer months in the Western Cape, and the dry winter months in the rest of the country. Often wildland fires are started by lightning or, in mountainous regions, by falling rocks. Most, however, are started by accident by people being careless with open flames and indifferent to the consequences of their carelessness. About 70% of the ecosystems covering South Africa are fire-adapted. They need to burn in order to maintain their ecological integrity. But because of human activity there is a need to manage fire in a manner that is appropriate for the land-use and land-type, while maintaining natural processes and patterns as far as possible. A million years ago early humans began to utilise fire and for the last 100 000 years modern humans have used veldfires for hunting and for managing their environment. Today, fire is still employed in the management of veld and forest, to control grazing and habitats, and as a tool in the prevention of uncontrolled fires. However, small fires frequently escalate into disastrous, uncontrolled wildfires. An increase in invasive alien plants is a cause for concern as they increase fuel loads. High fuel loads exacerbate the intensity and heat of fires, making more difficult to control and dangerous to suppress. Climate Change is expected to increase temperatures over parts of the interior of South Africa by as much as 3 to 5°C by the end of the century. Longer dry spells may also occur more frequently during all seasons. Increasing temperatures and increased drought frequencies combine to exacerbate the incidence of fire risk. Working on Fire advocates a holistic approach to managing fire, called Integrated Fire Management (IFM) – a concept resulting from extensive and in-depth research in the field of fire behaviour. This approach is built on the notion that wildfires can be managed, if dealt with proactively, rather than reactively and that quality resources (the necessary equipment, vehicles, trained firefighters) should be available should a fire occur. This approach drastically minimises the loss of life, property and the environment. “Prevention is certainly better than cure” and for that reason Working on Fire advocates a proactive approach to fighting wildfires. This includes helping with putting the right legislation in place to govern how fires are managed, creating community awareness and educating communities on fire safety, advocating and implementing prescribed fires and fuel load reduction. The aftermath of a wildfire, requires rehabilitation of the burnt area. Immediate dangers include soil erosion and longer-term damage by invasion of exotic and invasive plant species. In commercial areas, there can be a need to remove burnt materials and re-plant commercial crops and trees. In order to be better prepared in the future, research should be done to determine how the fire started, what contributed to the spreading thereof and how best to prevent similar occurrences it in the future. Uncontrolled fires pose a risk to life, property, and the environment. The expansion of human settlements into areas bordering fire-adapted conservation lands and fire-vulnerable commercial agriculture, has put people increasingly at risk. According to the National Veld and Forest Fire Act of 1998, the responsibility for the start, or spread of fire rests with the land user. It promotes the formation of Fire Protection Associations (FPAs). It is compulsory for all public landowners to be members of a local FPA.